Good morning! It's Jeanne sharing with you today. My nephew just got engaged and we're having a celebration lunch for his bride-to-be so I wanted to make her a special card. This elegant card is fitting for her personality! 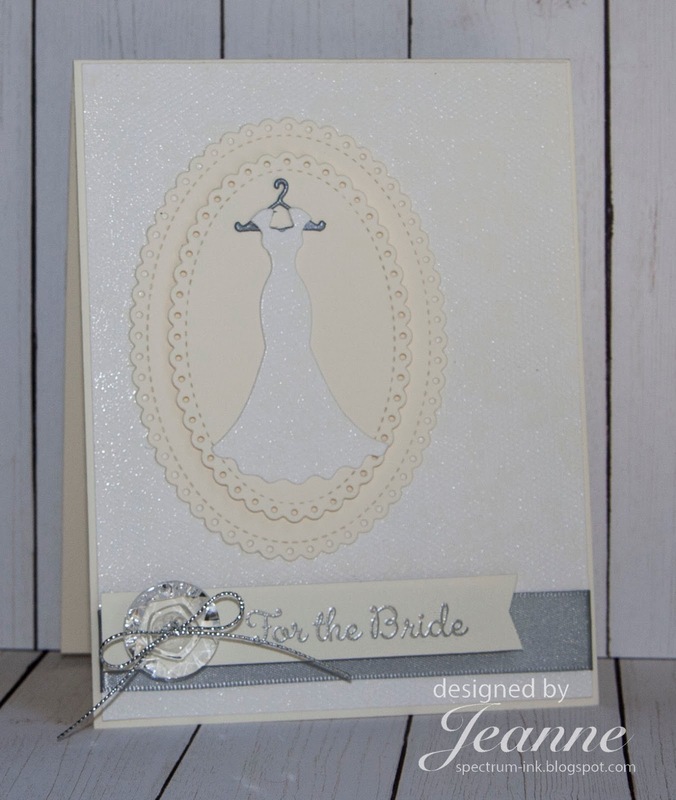 The card uses only two colors of card stock - white and vanilla. 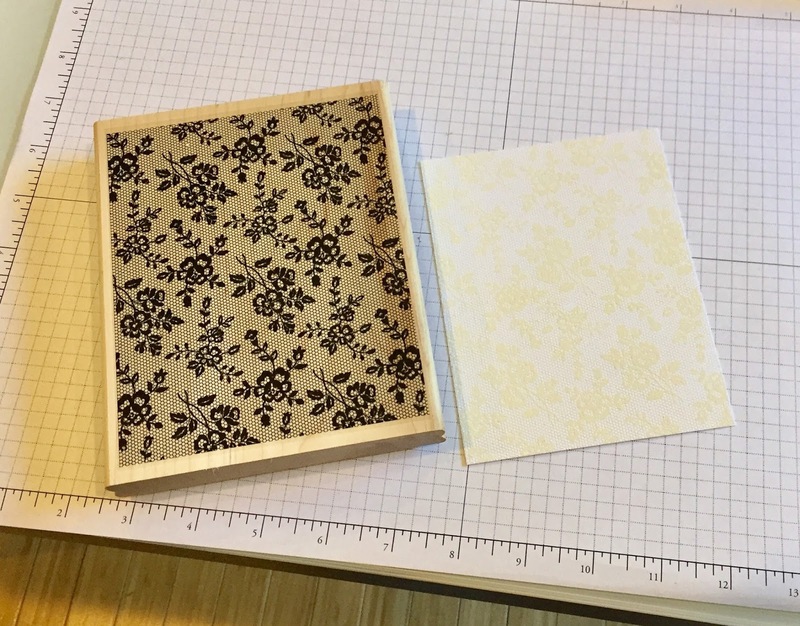 It's a top folding card so I cut the vanilla base 4 1/4 x 11 and scored at the 5 1/2 inch mark. 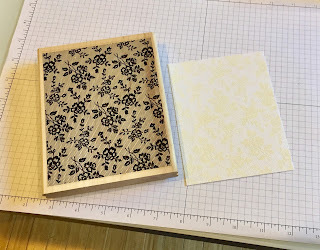 I used a piece of white card stock cut to 4 1/4 x 5 1/2 for the front panel and scraps of vanilla and white for the die cut pieces. (And I used a tiny piece of silver CS for the hanger! You could cut it out of white and color it instead.) My banner is 3 1/2 x 5/8 inches. I used paper snips to cut a flag at one end. 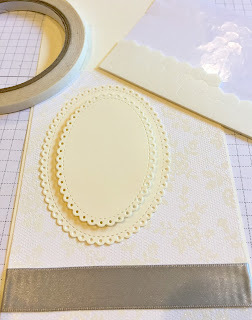 I heat embossed the 4 1/4 x 5 1/2 inch white card stock and the white scrap using a lace background stamp and white embossing powder. The powder I had came out a little bit cream color giving it a nice contrast to the white and blending well with the vanilla. I die cut the dress from the scrap and trimmed the full panel down to 4 1/8 x 5 3/8. 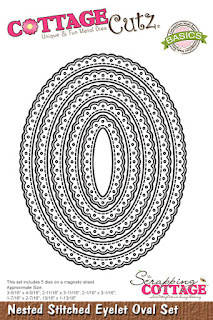 I cut my ovals using the middle and second largest ovals from the Nested Stitched Eyelet Oval set. 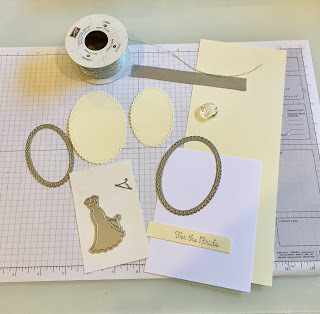 The larger oval is adhered directly to the card so I used Scor-Tape to make certain it stuck to the embossing - any really strong adhesive should work. 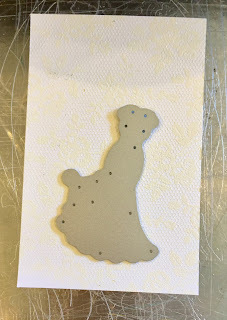 The embossing is slick so the adhesive needs to be strong. The smaller oval is popped off the card using foam dots. 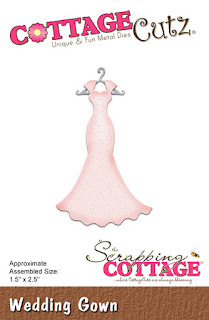 The die cut dress and hanger were added to the top. I finished off the card by embossing the sentiment in silver and using silver ribbon and a crystal button. I hope you enjoyed this card - I had a lot of fun making it! Gorgeous love the color combo really beautiful! Fabulous card! 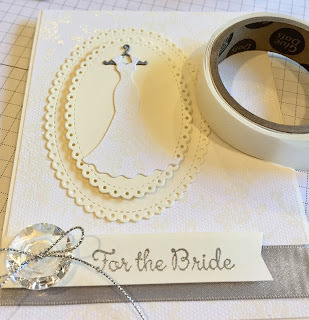 The embossing looks so amazing and elegant, so very pretty! 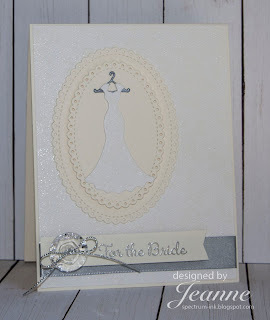 This is such a beautiful card for the bride. I love the color combination. Beautiful! I like the layout and beautiful colors.